During the paleolithic era of no internet connection, the word “seminar” aroused equal dread both in the speaker and the participant. Risks were high: while going from the blackboard to retrospectives, you could easily find yourself facing a quiet and passive audience or even worse, see the participants taking a collective nap. Nowadays, seminars, conferences and workshops have all been put under a more glamorous label: corporate event. And from now on you can benefit from using an amazing tool – most of the attendees have a smartphone in their pocket. If you follow some simple tips, your event app will not only make people forget about viral cat videos, but most importantly it will help you boost the attention of the audience during the event. An event app helps you to put together lots of useful information: location, schedule, reminders, attached documents, speaker profiles and subjects of discussion. Do not hesitate to highlight in your app the elements that will help you to prepare your audience. You plan to give out some goodies at the end of the event? Don’t keep it secret! One of the speakers is an international leading expert? Create a profile that will spark as much excitement as the last Apple KeyNote. That way you will have already created enough buzz and aroused the audience’s curiosity before D-day. An event app allows you to form a list of participants ahead of the event, which you can then use to make groups of key profiles. This will help you to manage the event in the best way possible. The “shy student syndrome” does not disappear once school is over. A lot of the attendees will not dare to speak or ask a question, even if it’s a question that interests everyone. 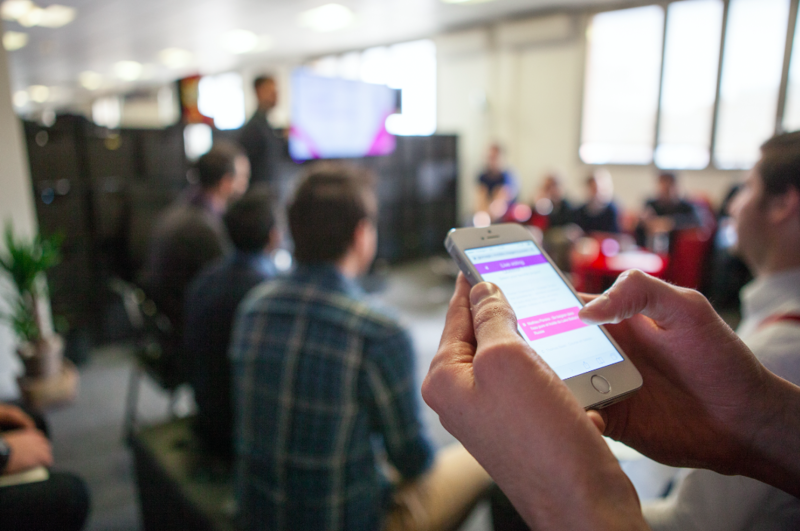 A live chat allows to focus the attention and encourage the responsiveness of the shy members of the audience: staying safely hidden behind their smartphones, they will become active participants. Serious games have proved to be very efficient: the playful entertaining aspect encourages people to relax and interact with other participants. For example, attendees can do small quiz in the application after each performance to collect points and get a badge at the end of the event. If the audience feel that their opinion counts, they become more attentive: by asking them to evaluate the speakers and their performances, you will not only be able to collect important information, but you will also make your audience an active participant in the event. • Your event becomes viral when the participants share statuses, photos and videos on Linkedin, Twitter, Facebook or Instagram. • You form a committed community involved in the same event. Here’s some foolproof advice: come up with an easy-to-remember hashtag before the event and use it in all of your visuals. The attendees will memorize it and add it to their posts. It often happens that the participants grow a bit tired by the end of the day, no matter what amazing activities you have offered them. An event app can help solve this problem by sending funny push notifications an hour before the end of the event, for example “Hey, just a little more! You will soon get a treat”. An event app will, of course, allow you to gather precious information about the level of engagement of your audience, the quality of your program, difficulties and obstacles encountered, and so on. But the appreciation that your audience shows you deserves gratitude: thank them by sending an email, share the best tweets or photos to keep the audience committed even after the event is over. That way the attendees will remember it as #notboring.